(KAIT) - Power outages continue Sunday for much of Region 8 following a winter storm that hit Saturday and into the early morning hours. Chief Meteorologist Ryan Vaughan says the last of the wintry mix has moved out and we are seeing clearing skies in our northern counties. The sky will clear today, giving us sunshine and temperatures above freezing, which should hopefully melt much of the ice. City of Diaz is opening a warming shelter at their fire department for those without power. Entergy Arkansas is reporting around 600 outages across Arkansas, many of which are in Region 8. Entergy posted on its outage map that its crews are working to restore service quickly. Jackson County: 51 customers affected - Customers in Tuckerman and Grubbs are affected along with several outages reported near Murphys Corner and Stegall. Mississippi County: 241 customers affected - Outages are being reported in Dyess and with homes along Highway 14 east and along Highway 61. Outages are also being reported from Gosnell, east of Blytheville toward Armorel. Poinsett County; 53 customers affected - Outages extend along Highway 14 near Waldenburg and Harrisburg. “At this time, it is estimated that all service will be restored by 8 pm Sunday 12-9,” the notice from Entergy Arkansas said. David Burnette, a spokesman for Entergy Arkansas, said the utility lost a section of transmission line that affected substations feeding Marked Tree, Trumann, Harrisburg and Bay Saturday evening, with several thousand customers losing power. The utility has staged additional linemen and scouts in the area and will continue with restoration efforts Sunday morning, Burnette said in a statement. To report an outage with Entergy call: 1 (800) 9OUTAGE or 1 (800) 968-8243. In an early morning update, Craighead Electric said crews have worked through the night to restore power. Around 1,097 members were without power Sunday morning but crews worked all day Sunday to cut that number down to around 50. “We have 11 broke poles on the Childress circuit out of the Black Oak substation. Crews will continue to work to replace poles. This is the area around Monette. Power to the Lake City and Black Oak Substations has not been restored due to ice falling off the lower lines," the company stated in a Facebook post. Entergy represpentative David Burnett says they’ve had widespread outages in the Region 8 area. State wide Entergy has around 4,400 customers without powers. Burnett said Region 8 was hardest hit. He said it would be helpful to inspect their meter loops to see if they have any damage. This is the box on the side of the customers home. However, DO NOT inspect power lines! It isn’t safe. Burnett says they are sending scouts ahead to areas to assess damage as they send crews in. The city of Jonesboro dealt with power issues during the winter storm as well. Kevin Imboden says around 50 to 100 people are without power in the city. He told Region 8 News that trees falling onto power lines are creating further outages. He encourages anyone without power to call CWL’s main number - 870-935-5581. The winter storm left ice and slush on many roads across Region 8. Traffic is being diverted on I-55 in Mississippi County due to a jack-knifed truck. In Clay County, Sheriff Terry Miller posted on Facebook that Highway 49 extending from Piggott to Rector has become impassible. Miller says they have multiple vehicles in the ditch due to the ice covered road. If you must travel any highways on the Eastern side of Clay County, he stresses to use extreme caution. Road crews around Region 8 were out laying sand and salt on the roads to help keep you safe. According to a post from the City of Walnut Ridge Facebook page, crews were laying sand on bridges and intersections. Use caution if you get out on the roads and give road crews plenty of space to do their job. We also have pictures that you have sent us from this winter weather. Also, the city of Naylor, Missouri is under a boil order for drinking water until further notice, city water bill clerk Sandra Day said Sunday. Due to wintry weather this weekend, some organizations have decided to postpone, cancel, or add dates to events scheduled to take place. The city of Bono has rescheduled its annual Christmas parade. It was originally set for Dec. 8, but will now take place on Saturday, Dec. 15 at 6:30 p.m.
At Arkansas State University, the Horticulture Garden Club Meeting that was scheduled at 2 p.m. in the Agricultural Building has been cancelled. The Crowley’s Ridge State Park’s Christmas Ornament Food Drive is scheduled to take place on Dec. 8 despite the forecast, but Elizabeth Kimble with the state park said in a news release that a second date has been added. That date is Dec. 16 from 1 p.m. to 3 p.m. at the Group Lodging Area Dining Hall. ACT Test Cancelled @ GCT High School and Paragould High School. The Annual Make-A-Wish and AG For Autism Auction has been postponed until Sunday at 5 p.m. The wish granting will happen at 2 p.m. Sunday. The ACT test scheduled for Saturday, Dec. 8, at ASU-Newport is canceled. The test will be rescheduled for a later date. Swifton Christmas Parade will be postponed until next Saturday, Dec. 15 at 5 p.m.
Peewee intramural games have been canceled for Saturday. The Hardy Christmas Parade has been postponed until Dec. 15. The Trumann School District posted on Facebook that, the THS play, “It’s a Wonderful Life,” has been cancelled for tonight’s showing (Saturday) that was set to start at 7pm. The matinee is still scheduled for Sunday at 2pm, pending weather. There will be an additional performance on Monday, December 10 at 7pm. The Arkansas Welcome Center in Blytheville is now open. The Haven of Northeast Arkansas in Blytheville have canceled the BLI volunteer project scheduled to take place on Dec. 7 and Dec. 8 due to the weather, along with a volunteer training session scheduled for Dec. 8. The Facebook post states both events will be rescheduled. The Purple Heart Post dedication in Manila scheduled for Sunday, Dec. 8, has been postponed until next Sunday, Dec. 16 at 1 p.m.
Due to the forecast of Inclement Weather, all ACT’s being given in our local area tomorrow have been canceled. This includes the following testing locations: Lyon College, Batesville High, Midland High, Cave City High. We will post the rescheduled date as soon as we are made aware. The Mark Martin Automotive-Lyon College tournament games for today have been cancelled due to inclement weather. The games are rescheduled on December 12th. NEA Youth Fishing tournament scheduled for Saturday, Dec. 8, at Crown Lake near Horseshoe Bend, AR, has been canceled. Breakfast with Santa scheduled for Saturday, Dec. 8, at Fulton County Fairgrounds has been canceled. The Cardwell Christmas Parade scheduled for Saturday, Dec. 8, has been postponed until Monday, Dec. 17, at 6 p.m. Those interested in being in the parade should call city hall at 573-654-2112. The West Plains Christmas Parade will also be moved to Saturday, December 15th at 2:00 PM. To submit an event cancellation, email news@kait8.com. Several sporting events have also been canceled or postponed. Click here for the full list. During a severe winter weather event, many normal activities take a back seat, as the stresses that snow, sleet, and ice place on public infrastructures and private enterprise become evident. These times can become life-threatening unless proper care and precautions are taken. One of the best ways to take proper care is to slow down - walk slowly on ice, drive slower on the roads, avoid making hasty decisions and keep aware of your surroundings. 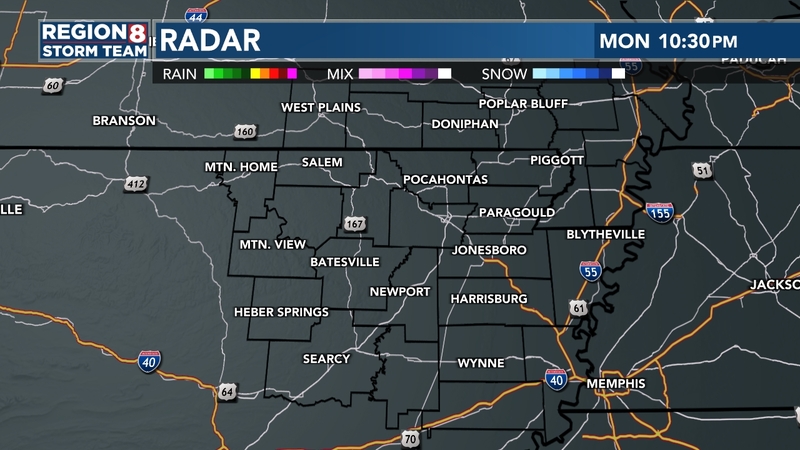 - Watch the latest forecasts on KAIT-TV at 4:30-7 a.m., Midday at 11 a.m., News at 5, 6, and 10 p.m. on KAIT8 and at 6:30 p.m. on NBC Region 8. Newscasts are available over the air, on cable & satellite where available, on kait8.com, on the Region 8 News mobile app for smartphones and tablets (to install or update the news app search KAIT in your mobile marketplace). Region 8 News Roku channel is also available. Many in Region 8 may experience power outages. If you are without power, don’t delay, call your energy provider. Here are some numbers for easy reference. What should I do if a winter storm strands me in my vehicle? Stay in the vehicle. Do not leave the vehicle to search for assistance unless help is visible within 100 yards. You may become disoriented and lost in blowing and drifting snow. Display a trouble sign by hanging a brightly colored cloth on the radio antenna and raising the hood. Turn on the vehicle's engine for about 10 minutes each hour and run the heat to keep warm. Also, turn on the vehicle's dome light when the vehicle is running as an additional signal. Watch for signs of frostbite and hypothermia. Do minor exercises to keep up circulation. Clap hands and move arms and legs occasionally. Try not to stay in one position for too long. If more than one person is in the vehicle, take turns sleeping. For warmth, huddle together. Use newspapers, maps, and even the removable car mats for added insulation. Avoid overexertion since cold weather puts an added strain on the heart. Unaccustomed exercise such as shoveling snow or pushing a vehicle can bring on a heart attack or make other medical conditions worse. Be aware of symptoms of dehydration. What kinds of injuries are associated with winter storms? What is wind chill? Wind chill is an estimation of how cold it feels outside when the effects of temperature and wind speed are combined. Unprotected portions of the body, such as the face or hands, can chill rapidly and should be protected as much as possible from the cold wind. A 10 mile per hour wind combined with a 30°F temperature can have the same chilling effect on the body as a temperature of 21°F in a calm atmosphere. The Weather Service issues this information as the wind chill index. For more information, see OSHA's The Cold Stress Equation. What is frostbite? 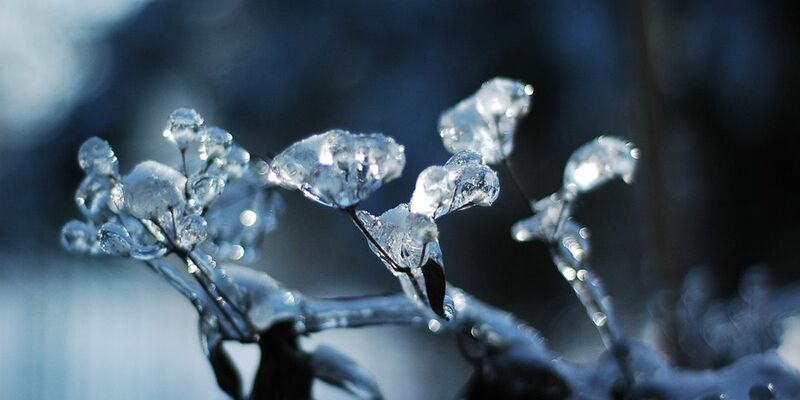 Frostbite is a severe reaction to cold exposure that causes freezing in the deep layers of skin and tissue. Frostbite can cause permanent damage. It is recognizable by a loss of feeling and a waxy-white or pale appearance in fingers, toes, nose, or earlobes. For more information, see OSHA's The Cold Stress Equation. What is hypothermia? Hypothermia occurs when the body temperature drops to less than 95°F. Symptoms of hypothermia include uncontrollable shivering, slow speech, memory lapses, frequent stumbling, drowsiness, and exhaustion. For more information, see OSHA's The Cold Stress Equation. What can be done to avoid frostbite and hypothermia? -Recognize the environmental and workplace conditions that lead to potential cold-induced illnesses and injuries. -Learn the signs and symptoms of cold-induced illnesses/injuries and what to do to help those who are affected. -Train the workforce about cold-induced illnesses and injuries. -Select proper clothing for cold, wet, and windy conditions. -Layer clothing to adjust to changing environmental temperatures. Wear a hat and gloves, in addition to underwear that will keep water away from the skin (polypropylene). -Take frequent short breaks in warm dry shelters to allow the body to warm up. -Perform work during the warmest part of the day. -Avoid exhaustion or fatigue because energy is needed to keep muscles warm. -Use the buddy system (work in pairs). -Drink warm, sweet beverages (sugar water, sports-type drinks). Avoid drinks with caffeine (coffee, tea, or hot chocolate) or alcohol. -Eat warm, high-calorie foods like hot pasta dishes. Who is at increased risk of frostbite and hypothermia? Victims of hypothermia are often (1) elderly people with inadequate food, clothing, or heating; (2) babies sleeping in cold bedrooms; (3) people who remain outdoors for long periods - the homeless, hikers, hunters, etc. ; and (4) people who drink alcohol or use illicit drugs. Victims may also include people with predisposing health conditions such as cardiovascular disease, diabetes, and hypertension, people that take certain medication (check with your healthcare provider and ask if any medicines you are taking affect you while working in cold environments), and people in poor physical condition or who have a poor diet. For more information, see Extreme Cold: A Prevention Guide to Promote Your Personal Health and Safety. How do I treat a person with frostbite or hypothermia? If frostbite or hypothermia is suspected, begin warming the person slowly and seek immediate medical assistance. Warm the person's trunk first. Use your own body heat to help. Arms and legs should be warmed last because stimulation of the limbs can drive cold blood toward the heart and lead to heart failure. Put the person in dry clothing and wrap their entire body in a blanket. Never give a frostbite or hypothermia victim something with caffeine in it (like coffee or tea) or alcohol. Caffeine, a stimulant, can cause the heart to beat faster and hasten the effects the cold has on the body. Alcohol, a depressant, can slow the heart and also hasten the ill effects of cold body temperatures. How do I walk safely on snow and ice? -Walking on snow or ice is especially treacherous and wearing proper footwear is essential. A pair of well-insulated boots with good rubber treads is a must for walking during or after a winter storm. -Keeping a pair of rubber over-shoes with good treads which fit over your street shoes is a good idea during the winter months. -When walking on an icy or snow-covered walkway, take short steps and walk at a slower pace so you can react quickly to a change in traction. -When walking on a sidewalk which has not been cleared and you must walk in the street, walk against the traffic and as close to the curb as you can. -Be on the lookout for vehicles which may have lost traction and are slipping towards you. Be aware that approaching vehicles may not be able to stop at crosswalks or traffic signals. -At night, wear bright clothing or reflective gear, as dark clothing will make it difficult for motorists to see you. -During the daytime, wear sunglasses to help you see better and avoid hazards. -Electrocution by contacting downed energized lines, or contacting objects, such as broken tree limbs, in contact with fallen lines. -Falls from heights. -Being struck or crushed by falling poles, towers or parts thereof, tree limbs, ice accumulation on lines, towers and poles. -Being injured in vehicular accidents when responding to an emergency situation. -Burns from fires caused by energized line contact or equipment failure. -Electrocution by contacting downed energized lines or contacting broken tree limbs in contact with fallen lines. -Falls from trees. -Being struck or crushed by falling tree limbs or ice. -Being injured by emergency equipment such as chainsaws and chippers. -Brakes: Brakes should provide even and balanced braking. Also check that brake fluid is at the proper level. -Cooling System: Ensure a proper mixture of 50/50 antifreeze and water in the cooling system at the proper level. -Electrical System: Check that battery is fully charged and that connections are clean. Check that the alternator belt is in good condition with proper tension. -Engine: Inspect all engine systems. -Exhaust System: Check exhaust for leaks and that all clamps and hangers are snug. -Tires: Check for proper tread depth and no signs of damage or uneven wear. Check for proper tire inflation. -Oil: Check that oil is at the proper level. -Visibility Systems: Inspect all exterior lights, defrosters (windshield and rear window), and wipers. Install winter windshield wipers. For more information, see the National Safety Council's Winter, Your Car and You [45 KB PDF, 2 pages]. Copyright 2018, KAIT, All rights reserved. M 3.6 quake rattled the New Madrid Seismic Zone early Wednesday morning. A quick peek at today's rain chances.